McCLINTOCK, Sir FRANCIS LEOPOLD, naval officer and Arctic explorer; b. 8 July 1819 in Dundalk (Republic of Ireland), second of the 12 children of Henry McClintock, a customs officer, and Elizabeth Melesina Fleury; m. 12 Oct. 1870 Annette Elizabeth Dunlop in Monasterboice (Republic of Ireland), and they had three sons and two daughters; d. 17 Nov. 1907 in London, England. Leopold McClintock entered the Royal Navy as a first-class volunteer on 22 June 1831. His career began in peacetime, when active service was seldom eventful and promotion was slow. 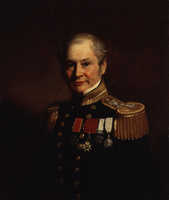 He was stationed off South America until 1835, spent two years as a midshipman in British waters, and from 1838 to 1841 served in the West Indies and in eastern Canadian waters. He was made acting mate on 23 Oct. 1838. 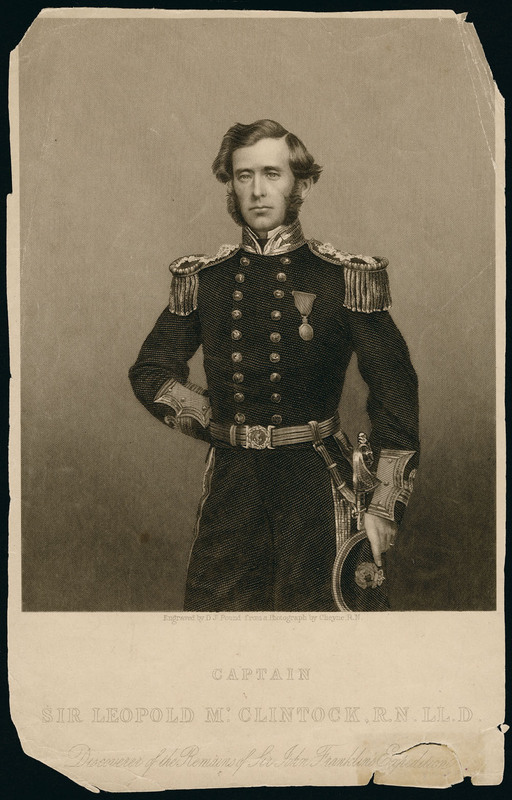 In 1841–42 he studied at Portsmouth, England, to qualify as a lieutenant, but he spent two years as a gunnery mate off Brazil before gaining his promotion, on 29 July 1845. He subsequently served in the Pacific, returning home in 1847. McClintock’s introduction to sledging was a landmark in Arctic history. Long-distance travel over ice was almost unknown among polar explorers, and the veteran Ross, who had travelled extensively with the Inuit, was one of the few with experience of Arctic sledging. McClintock learned much from Ross, but he still saw scope for improvement. After his return home in November 1849 he began designing better equipment and a comprehensive new sledging system. Taking advantage of the large crews on naval ships, McClintock devised a system based on hauling by men rather than dogs. Its main features included: sledge teams of six or seven seamen led by an officer; advance parties to lay down provisions and fuel; a supporting party to accompany the main party for up to half the outward journey and carry the extra weight of supplies in the early stages; sledges, camping equipment, clothes, and diets all made to McClintock’s specifications and owing little to existing Inuit models; sails to aid travel downwind; and names, mottoes, and flags on sledges to foster team spirit. McClintock’s system would revolutionize polar exploration by allowing seaborne expeditions to extend their range by thousands of miles. In the four years after 1849 alone it enabled expeditions to discover vast areas of the Arctic Archipelago. McClintock was appointed first lieutenant in February 1850 on the Assistance, in Horatio Thomas Austin*’s search for Franklin, and he was put in charge of sledging. The expedition wintered in Barrow Strait, and in the spring of 1851 over 20 sledge parties covered the central area of the archipelago. They discovered hundreds of miles of coast, mainly among the Parry Islands. McClintock made the longest trip, between 15 April and 4 July, travelling west to Melville Island and covering about 760 miles. 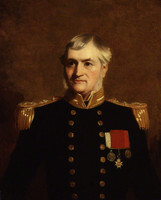 The expedition arrived home in September and McClintock was promoted commander on 11 October. 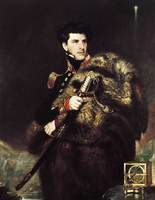 On 10 Feb. 1852 he was placed in command of the Intrepid in Edward Belcher*’s major search expedition. McClintock was in its western branch, led by Henry Kellett*, which spent the winter of 1852–53 off Melville Island. He again organized the sledging, and in the spring many parties looked for Franklin and explored new land. McClintock’s team sledged a record 1,210 miles between 4 April and 18 July, discovering parts of Prince Patrick, Emerald, Eglinton, and Melville islands. The expedition spent a second winter in the Arctic and then, in the summer of 1854, on Belcher’s orders, abandoned four of its five ships, including the Intrepid, and returned home. McClintock was promoted captain on 21 Oct. 1854. 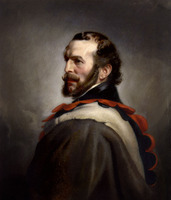 That same month John Rae* of the Hudson’s Bay Company announced his partial discovery, near King William Island, of the Franklin expedition’s fate. The news caused the Admiralty to give up its search, but Lady Franklin [Griffin*] remained anxious to know how her husband had died. 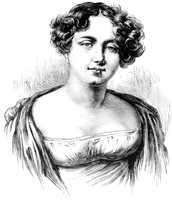 She planned her own expedition to complete the search, and McClintock, who had no naval employment in 1855–56, became her adviser. She bought the steam-yacht Fox and on 18 April 1857 appointed McClintock to command it. The Fox left Aberdeen on 2 July, became beset in Baffin Bay, and spent the winter drifting in the ice. In 1858 McClintock resumed the voyage and reached Bellot Strait, off Prince Regent Inlet, where he wintered. In April–June 1859 he and William Robert Hobson each led a sledge party to King William Island. They found relics, skeletons, and two messages which showed conclusively that Franklin and his men had perished there. On this occasion the sledge teams combined men and dogs because of the Fox’s small crew. (From then on McClintock would urge ever-greater use of dogs, though naval tradition remained stubbornly committed to man-hauling.) He returned home in September 1859 and received many honours, including honorary degrees and a knighthood on 23 Feb. 1860, for his achievement in revealing Franklin’s fate. McClintock made his last visit to the Arctic in July–November 1860, when he commanded the Bulldog on a naval voyage to investigate a route for a telegraph cable from Scotland to Labrador by way of Greenland. For the rest of his career he undertook routine duties. 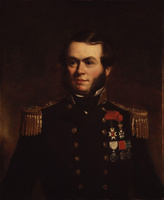 He commanded the Doris in the Mediterranean in 1861–62 and the Aurora around Britain in 1863–65. In 1865–68 he was commodore in Jamaica. On 1 Oct. 1871 he was promoted rear-admiral, and in 1872–77 he was admiral superintendent of Portsmouth Dockyard; he was made vice-admiral on 5 Aug. 1877. 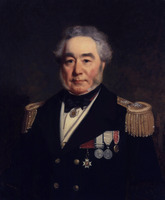 His final naval appointment was as commander-in-chief of the North America and West Indies station in 1879–82, a posting that often brought him to Halifax. In February 1884 he was elected an elder brother of Trinity House, a position he would hold until his death. Promoted admiral on 7 July 1884, a day before he retired, he was made a kcb in 1891. Throughout his post-Arctic career, he maintained an interest in exploration. 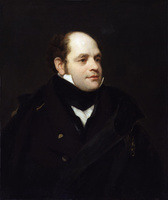 He joined the council of the Royal Geographical Society in 1869, and he played a prominent role in the organization of George Strong Nares’s voyage to the Arctic in 1875–76 – McClintock was then a member of the Admiralty’s Arctic committee – and Robert Falcon Scott’s Antarctic expedition of 1901–4. A number of geographical features in Canada, of which the most prominent is M’Clintock Channel, have been named after him. McClintock’s finest achievements were his contribution to the solving of the Franklin mystery and his development of a sledging method that led to the rapid exploration of many of Canada’s Arctic islands. 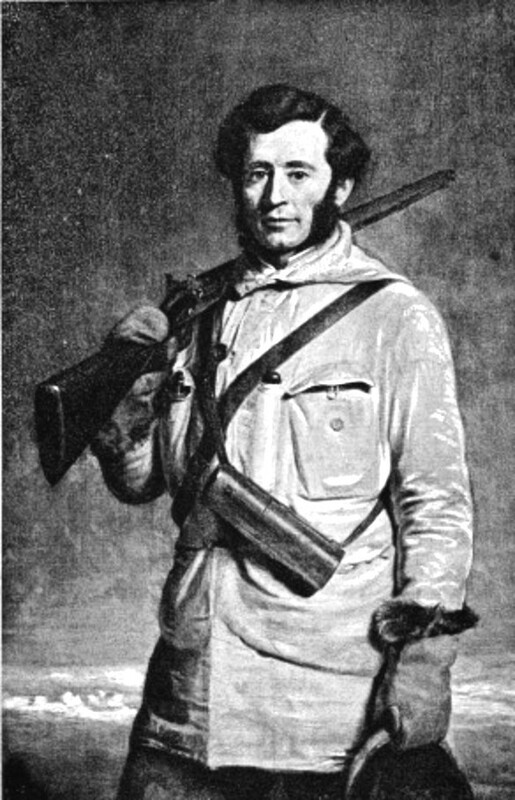 His sledging system has been criticized for being too slow and laborious, and for borrowing too little from the experience of the Inuit and of contemporary explorer John Rae, who was successful in adopting their methods. Undoubtedly, it survived as a British naval tradition for too long after Scandinavian and American explorers had developed much better sledging methods based on Inuit practice, especially the use of dogs and lighter and more flexible sledges. The race for the South Pole between Roald Amundsen and Scott in 1911–12, which resulted in Amundsen’s easy victory and Scott’s death, is often cited as the classic confrontation between the two methods and the final condemnation of the naval method. But McClintock’s system was highly successful in meeting the urgent needs of the Franklin searchers in the 1850s, and that is the context in which it should be judged. Sir Francis Leopold McClintock’s account of the Fox expedition was published as The voyage of the “Fox” in the Arctic seas: a narrative of the discovery of the fate of Sir John Franklin and his companions (London, 1859), and went through numerous editions. A facsimile reprint of the first edition has been issued (Edmonton, 1972). In addition, McClintock published the following reports in geographical journals: “Reminiscences of Arctic ice-travel in search of Sir John Franklin and his companions” in the Royal Dublin Soc., Journal, 1 (1856–57): 183–238 (accompanied by illustrations and descriptions of geological specimens by Samuel Haughton, professor of geology at Trinity College, Dublin, 239–50); and “Surveys of H.M.S. Bulldog” and “On Arctic sledge-travelling” in the Royal Geographical Soc., Proc. (London), 5 (1860–61): 62–70 and 19 (1874–75): 464–79. McClintock’s papers, including correspondence and his journals and reports for the years 1848–49, 1852–54, and 1857–59, are preserved in the National Maritime Museum, London. Scott Polar Research Institute (Cambridge, Eng. ), ms 248/439 (F. L. McClintock, 28 letters to Lady Jane Franklin and Sophia Cracroft (Franklin’s niece), 1857–75). Debrett’s peerage, baronetage, knightage, and companionage . . . (London, 1907). DNB. Dominion annual rev., 1880/81–1882. 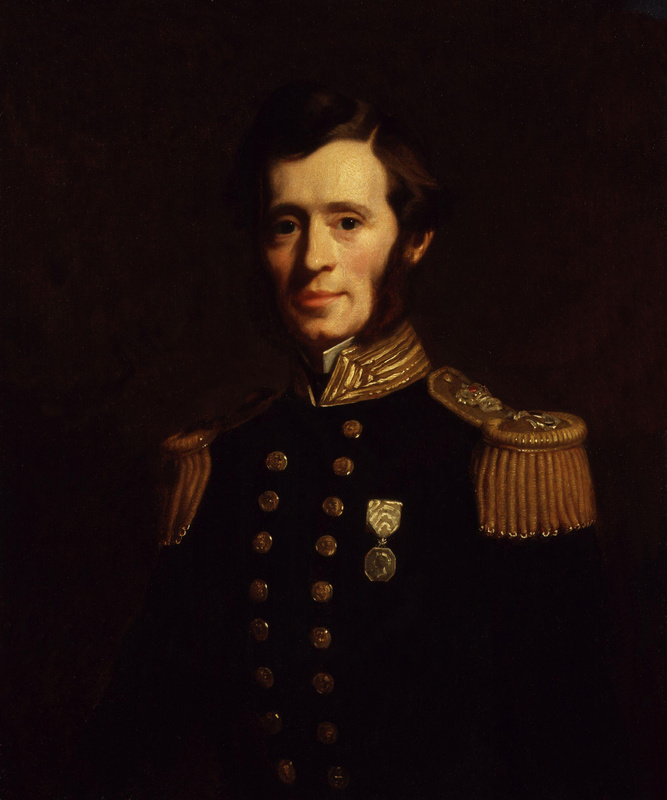 A. G. E. Jones, “Admiral Sir Leopold McClintock: a different view,” Fram, the Journal of Polar Studies (Bangor, Maine), 2 (1985): 290–325; “Sir James Clark Ross and the voyage of the Enterprise and Investigator, 1848–49,” Geographical Journal (London), 137 (1971): 165–79. C. R. Markham, “Admiral Sir Leopold M’Clintock, k.c.b.,” Geographical Journal, 31 (January–June 1908): 1–11, and photograph facing p.1; Life of Admiral Sir Leopold McClintock . . . (London, 1909). John Rae, John Rae’s correspondence with the Hudson’s Bay, Company on Arctic exploration, 1844–1855, ed. E. E. Rich and A. M. Johnson, intro. J. M. Wordie and R. J. Cyriax (London, 1953), intro., c.
Clive Holland, “McCLINTOCK, Sir FRANCIS LEOPOLD,” in Dictionary of Canadian Biography, vol. 13, University of Toronto/Université Laval, 2003–, accessed April 26, 2019, http://www.biographi.ca/en/bio/mcclintock_francis_leopold_13E.html.